SQL SERVER – Fix – Error :156 – Incorrect syntax near the keyword ‘UNION’. UNION operator is one of the most frequent operators used in SQL Server scripting. As per MSDN it is used to combine the results of two or more queries into a single result set that includes all the rows that belong to all queries in the union . But there is an issue with Union operator which prohibits order by for each table separately while using UNION / UNION ALL. It generates an error. Error Message: Incorrect syntax near the keyword ‘UNION’. 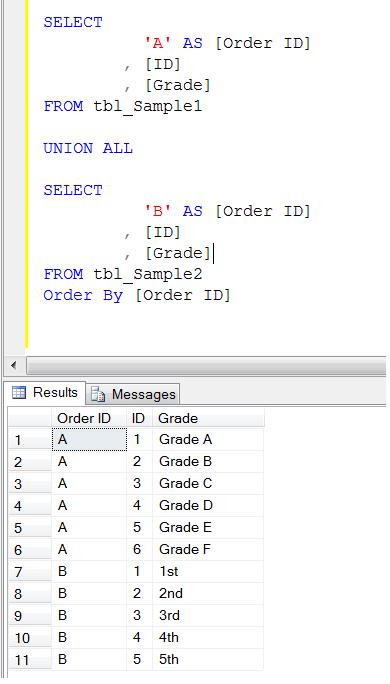 Once you created the above sample, lets make a UNION ALL query and try to ORDER BY each table separately. Ooopps…… I am unable to execute it. It is very simple to resolve, just add one more column with any sorting number… either 1,2,3 or A,B,C and order on the basis of this column. Let me demonstrate it. Remember, whenever you use UNION / UNION ALL and have to order by each table separately, just add one more column with any sorting value and order by on the basis of this column.